On part I of the article, I mentioned a couple of reasons why IT8 calibration is important for the digitizing process. 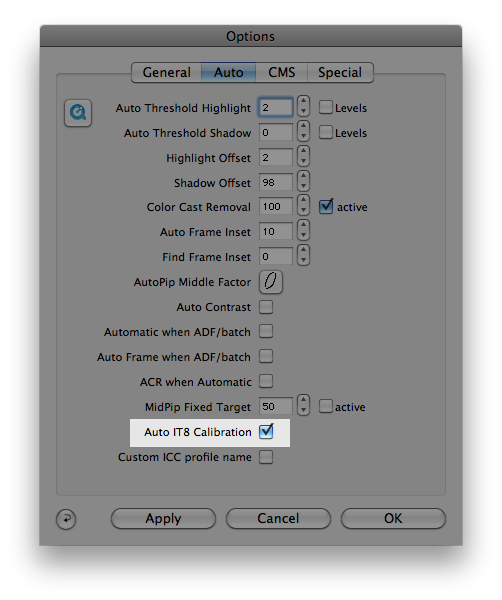 The manual calibration using SilverFast and third party IT8 targets was also explained. Automatic IT8 calibration using LaserSoft Imaging IT8 calibration targets and its patented technology. This process is very simple. Since the targets created by LaserSoft Imaging have a special barcode identifying them the automatic process makes pretty much every thing for us. Make sure the Automatic IT8 calibration is active (it should be by default). This can be made in the options dialogue/Auto tab. Options dialogue, Auto tab, Automatic IT8 calibration option. If you made any changes to your options dialogue apply and press “OK” to return to SilverFast. Place the IT8 calibration target onto the scanner bed. To avoid any problems with the automatic process make sure no other slide or picture is onto the scanner surface at this time, only the calibration target. If you have a film scanner introduce the IT8 calibration slide. The calibration process should take a couple of seconds and work automatically, it makes a scan, finds the target, places the mask correctly and reads the barcode, then it calls the reference file (sometimes this file is downloaded from the internet, hence is important to have your internet connection active) and proceeds with the calibration and creation of the profile. Once the process has been finished a message should appear indicating the Delta E value. IT8 targets should be replaced every 3 or 4 years. After this period of time changes in the target might affect the accuracy of the calibration because the values of the color patches included into the reference file are constant and do not reflect changes on the film emulsion. I tried to calibrate my Plustek 8100 with the IT8 target but I’m stuck when the ‘Open’ dialog pops up. Where is or where do I get the reference file? you don’t need to calibrate before any scanning session, every other month should be ok. However, you should calibrate if you move your scanner to another place or if the climate changes significantly (temperature, air humidity).